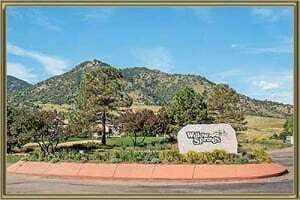 Homes in Willow Springs offer outstanding Golf Course living embraced by the Foothills where the Rocky Mountains begin just off Highway 285 and Willow Springs Road. The distinguished Willow Springs is about 6000 feet in elevation and offers stunning city views, golf course views and majestic red rock formations. There is a variety of homes for sale in Willow Springs with a majority being one and two story homes with several custom homes throughout. Construction started in the mid-1970’s and new homes are still being built. The manicured lawns sit on 4000 square feet to 2 acre lots and are accompanied with 2-3 car garages. Unique floor plans range from 2000-5000 square feet with walk-out basements. Homes for sale in Willow Springs have large decks that provide panoramic views of soaring eagles, elk and mule deer grazing in the meadows with all the nature the Foothills have to convey. The community has various homeowner associations and some include the community pool, trash and snow removal. This oasis has 15 miles of private trails, catch and release at Kingfisher Lake, horse trails with stables and an arena. You can drive your private golf cart for a round of golf or enjoy fine dining at the Red Rocks Country Club where memberships are optional. Head to historic Town of Morrison for unique shopping and eateries or attend the Red Rocks Park and Amphitheater for a night of entertainment. Additional shopping and dining is nearby at Colorado Mills Mall. For the golf enthusiast outside the community, you can choose from Homestead Golf Course,The Meadows Golf Club or Fox Hollow Golf Course. Homes in Willow Springs provide easy access to Highway 285, it’s only a short commute to Denver, the mountains and world class skiing. See what your home is worth With an Instant Home Valuation Online. Want advice on selling your house? We provide a free staging consultation, pre-listing prep plan, and a Willow Springs real estate market analysis. Call us at 303-325-5690 to learn more. New to the Area? Call our Willow Springs real estate agent at 303-325-5690 to schedule your tour of Homes in Morrison CO.